On Sunday, February 3, 2013 we visited Kingdom Life Church in San Antonio, TX. We enjoyed a great time with great friends and great praise and worship. Brandon Honeycutt delivered a great message about the walls in our lives that keep us from God’s best and hold us in a prison of doubt and fear. 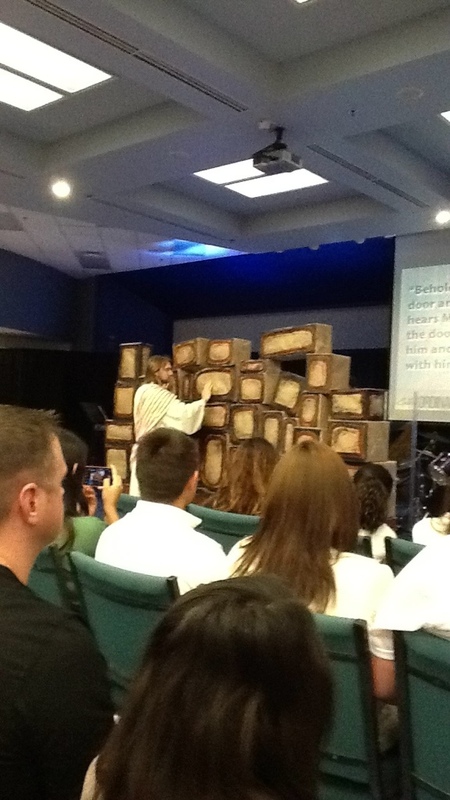 Great illustration of a wall being built during the message. Agape: the Greek word for love is unique to the New Testament to describe God’s love. According to Rick Renner, “Agape is divine love that gives and gives and gives, even if it is never responded to, thanked, or acknowledged.” – Sparkling Gems – Sept. 10. This definition alone demands a huge development for those who choose to walk in it. God is the master at demonstrating this kind of love, as we see in the way He gave Jesus for all, even those who would never even acknowledge His gift. This is beyond comparison in this known world and separates Christianity from religion on the highest level. We often celebrate sacrificial giving and enjoy stories of the same in our movies, books, and on the news. However, no story, modern or historical compares to the Love story of God through Jesus toward mankind. Wow! Have we ever experienced this? The answer is YES! We have received it. Even if we didn’t acknowledge it, this love has been shown to us through the life giving sacrifice of Jesus. Even if the first time we heard it we thought it was just a story. Even if we thought it was ‘old-people religion.’ Even if we actually disdained it and were angry towards those who tried to tell us about it. 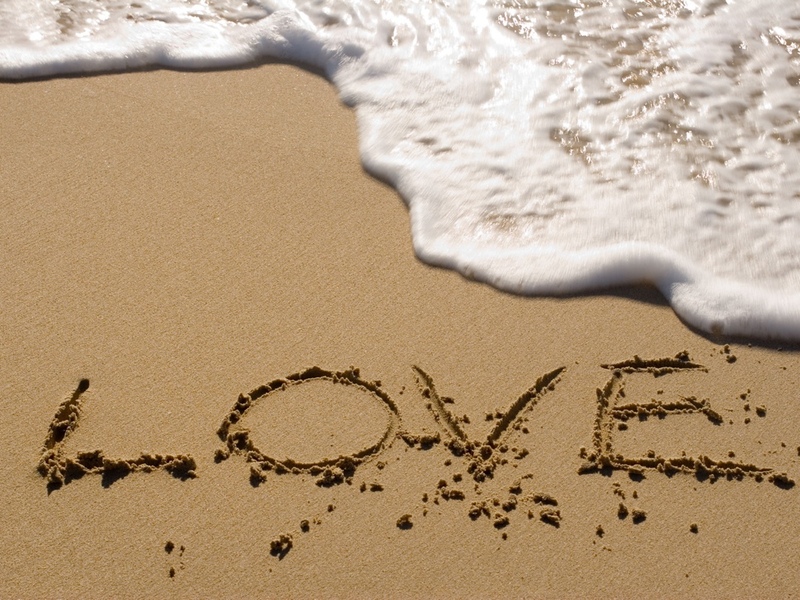 This love has been and is being shown to us regardless of how we responded or do respond. 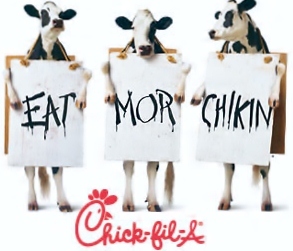 Over the past few months, I have often thought I should write a blog, or article about why I frequent the fast food restaurant, Chick-Fil-A. In light of recent comments and concerns over Chick-Fil-A’s CEO’s comments supporting the Biblical view of a family, I thought I should go ahead and share my thoughts. Now, let me preface this blog by saying I usually shy away from political disputes; not that I don’t have opinions, but I choose to forgo getting in the middle of comments, thoughts, and opinions that run rampant about political figures and parties. So, why do I love Chick-Fil-A? First of all, let me put this out there: They do have great chicken. I know, I know, they didn’t invent the chicken, but they sure do a great job of making it taste good. If I let myself go there, I seriously think I could eat two twelve piece nuggets, and an extra large waffle fries at each meal. Washing it down with a Dr. Pepper ain’t bad either. And those ice cream shakes! Have you had the cookies and cream shake? If not, you are missing half your life. I have tried several of the items on the menu, and have honestly never been disappointed. However, that is only a small portion of the reason I love Chick-Fil-A. The reason I frequent Chick-Fil-A, as opposed to other fast food restaurants, is summed up in two words: Customer Service. For years now, I have been impressed, not only with the great food, but the way I am treated every time I go to the restaurant, whether it be through the drive-through, or inside. Every time you say thank you to a Chick-Fil-A employee, they respond with, “My Pleasure!” I know it may seem like a robot answer, but the simple fact their employees are trained to do that, and seem to mean it (teenagers included), is amazing! Very few other fast-food restaurants come close to this level of kindness. I can honestly think of only one time, in all my years of eating at Chick-Fil-A, that the server seemed to be a little annoyed (and I know it wasn’t at me, ;-)). For years I wondered thoughts like, “How do they do this? Every Chick-Fil-A has employees like this! They must pay really good!? Why can’t other fast food establishments catch on to this culture?” My answer came a few months ago, when I heard an interview given by Dan Cathy, CEO (and the man in the hot seat right now). He made two outstanding comments that answered my questions completely. When asked how he gets the great company culture, and atmosphere that you find at every CFA, he responded with a scripture. By the way, this was not a “Christian” interview; it was a business interview, which impressed me with his answer even more. He said they base their business on Matthew 5:41, which says, “And if anyone forces you to go one mile, go with him two miles.” Simple. When a customer comes through their doors, they are already in the mindset of going above and beyond the customer’s expectations. Amazing! Secondly, Mr. Cathy was asked how he was able to get teenagers to be so kind, when the norm in most fast food places is a teenager who can’t count change, won’t smile, and appears to be annoyed with your “special request” for mustard instead of mayonnaise. He said, they simply employ managers and franchisee owners who understand that we live in a time in our country when most kids come from broken homes. So, when they hire a teenager, be prepared to be a mentor, and in some cases, as needed, even another parental figure. What happens? Teenagers feel valued, and loved, and want to do a great job! It works! So, what about all the current debacle of information concerning Dan Cathy’s support of marriage and family as the Bible describes it? Like most things,the storm will soon pass. People will forget they got their feelings hurt by the media making a mountain out of a molehill,Boston and Chicago will wake up to reality, and life will continue on. As for our support of Dan Cathy and Chick-Fil-A, it will continue in full force. We like the food, we enjoy the atmosphere, and we are glad to see a man stand up and support healthy families across the world, without shame. BCOC Discipleship 2011 from Michael Jones on Vimeo. Come join us for 6 weeks of refreshing from the Lord in a new set of disicpleship classes!